Selecting a tax-exempt location, investigating accelerated "bonus" depreciation, financing winglets during a prebuy and pairing the modification with services with similar or longer downtimes can all help manage costs. There isn’t much, if any, wiggle-room on the final bill for a winglet modification, but there are some cost-saving approaches to be had… if you do your homework. 1. Have the modification done at tax-exempt locations. Eliminating sales tax from a winglet modification offers a significant savings. Not many facilities qualify, however both of Duncan Aviation’s full service facilities are tax-exempt locations. 2. Ask your tax professional about accelerated “bonus” depreciation. Business Jet Traveler reported that legislation passed allowing companies to take advantage of accelerated “bonus” depreciation before the end of 2010. AINonline also reported that the accelerated depreciation applies to “strategic business purchases this year,” which includes business aircraft. Past accelerated depreciation has applied to winglets in the past, but it’s best to check with your tax professionals regarding if and how you can benefit. 3. Schedule winglets with a prebuy evaluation. A winglet modification can be rolled into the financing for an aircraft purchase at the time of the prebuy evaluation. This also eliminates the need for additional downtime after the aircraft is delivered. 4. Pair winglets with inspections or other modifications. 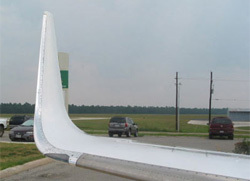 Blended winglets can be scheduled with inspections or modifications, often without extending downtime. Falcon 2000 series winglets take about four weeks, while Hawker 800 series winglets take about three weeks. To find out why the downtimes are so different between Falcon and Hawker aircraft, read next week’s blended winglet blog post. Find out more about Falcon 2000 series and Hawker 800 series winglets at www.DuncanAviation.aero/airframe. Or contact a member of Duncan Aviation’s Falcon or Hawker Airframe Service Sales team for information about our winglet installation capabilities.